Set Up: Depending on field space, this can be done using an entire half as shown, or a smaller grid. Three lines of players with middle line having the balls. 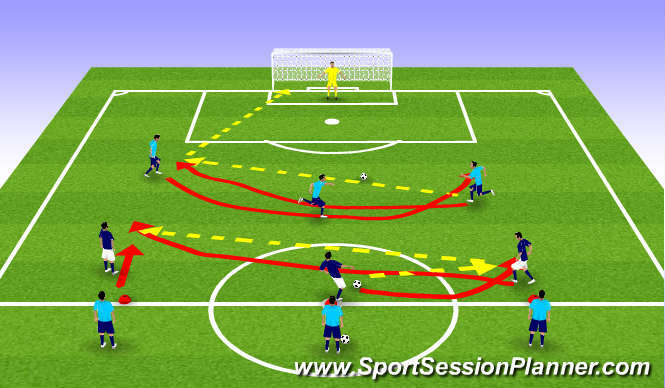 Activity: Middle line plays ball to outside line and overlaps, outside line then plays ball across field/grid to opposite player and then overlaps them. All the while, the players are moving up the field in "attack". Once ball gets to top of the box, whichever player is in possession of ball fires a shot. Coaching Points: Quality ball striking/passing, good first touch that leads player into their next pass, leading the pass so that play constantly moves down the field.